As the Christmas season approaches our thoughts turn more frequently to remembering the life and teaching of the One whose birth we celebrate on this day. With our world in such turmoil it is certain that we all need to understand and live the age old precepts He taught. With this in mind we remembered the radio program which was sponsored for many years by the Wrigley Company and broadcast over Columbia Broadcasting System under the direction of William Burch. At that time Pat Buttram was with us and Carl Cotner was director of music. Each year our Christmas program contained the story of the birth of Jesus with its beautiful Christmas music and songs. Since they were so well received we felt you would be happy to hear and enjoy them again. Therefore, this album is a compilation of some of those programs with some of our newer recordings. We hope it will help to remind us all again of the real meaning and spirit of Christmas. 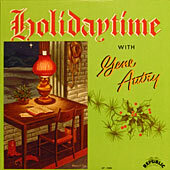 Carl Cotner Orchestra and Chorus on all tracks with Gene Autry.